It will most likely be announced on June 27th. Some sources have also said last week of June. Same date as the Honamii/H2 phone (with new Honami JPEG engine - same as the NEX-7 successor will get) is expected to be announced. The Honemi/H2 phone is rumored to get a 1/1.6″ or 2/3" Exmor RS stacked sensor and Cybershot G lens. 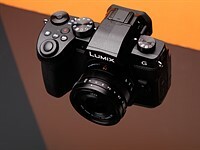 As well as Xenon flash, manual controls (as RX100), new image processing algorithm, similar to Sony’s Cyber-shot digital cameras and completely revamped camera UI, software goodies from Cyber-shot digital cameras of 2013.